Filene’s innovation programs help credit unions execute on innovation, ideas and cultural change. We will bring the Filene Method, our innovation curriculum which was developed from a decade of experience in creating, testing and implementing ideas, to lead your team to success. Create thinkers and innovators within your credit union to help solve your most pressing issues. Filene’s innovation programs help credit unions execute on innovation, ideas, and cultural change. Key elements from the Filene Method—an innovation curriculum developed from a decade of experience in creating, testing, and implementing ideas-are used to lead your team to success. Brian Aalbers shares how Filene helped Libro Credit Union harness employee passion and creativity to build an innovation framework. 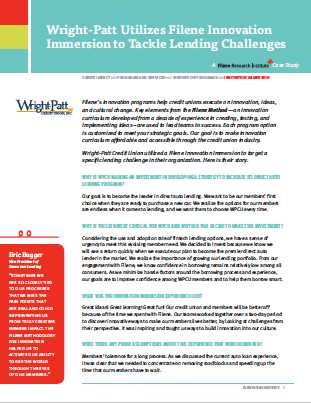 Eric Bugger explores how innovation programing helped them see through their members' eyes. Each program option can be customized to meet your strategic goals. Our goal is to make innovation curriculum affordable and accessible through the credit union industry. Innovation Immersion: A one- or two-day accelerated innovation process that helps credit unions, CUSOs, and state leagues address and prototype solutions for their biggest challenges. Innovation Immersion EXT: Ongoing support for Innovation Immersion participants that ensures the methodology learned stays alive, integrates into the organization, and truly drives change. Strong problem statements formulated from shared insights. A host of new ideas. The beginnings of strategic solutions that have been prototyped. New approaches to pitching innovative ideas to key stakeholders. And, an innovation competency to spread throughout the organization. Filene helps you gather 1-3 problems that your credit union, membership, or community faces. You choose a team of 3-12 employees to spend an entire day putting those problems through the Filene Method while learning the innovation process. The programs take place at either Filene’s creative space in Madison, WI, or at your credit union or another nearby creative space—your choice. Filene staff provides tools, research, and inspiration to create innovative solutions to the problems you identified. Program participants receive Filene Method workbooks, hands-on support from Filene's senior leaders, and a professional development experience that yields instant results. "Participating in the Filene Innovation Immersion gets you outside the four walls of your office, your box, and inspires you to think about what could be, and often times what should be, when it comes to serving our credit union Members. It stimulates great conversations and collaboration amongst credit unions, which is a key difference about our industry compared to others. This unique collaborative component of the credit union movement can lead to great innovation in the future."